Newspapers are reporting that more Formosan Blue Magpie (Urocissa caerulea) chicks have been stolen in Taipei. 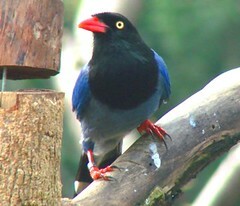 Formosan Blue Magpies are listed as "Near Threatened" on the IUCN Red Data List and regulated under CITES Appendix II. These birds can fetch up to NTD 80,000 (USD 2,500) on the black market. The Formosan Blue Magpie is protected under the Wildlife Protection Act, and selling them can result in a fine of up to NTD 300,000 (USD 9,375). Wild at Heart had recently reported that six young magpies were stolen near an elementary school in the Taipei suburb of Mucha.